The atmosphere was set as my intrepid companions and I entered the room. The boredom of having waited in long lines finally gave way to something interesting: a mirror hanging on the front wall, hidden behind a thick, black curtain. Once all the guests were inside, our tour guide began pointing out the various items around the room, building up suspense before the main event. The room contains several paintings/prints, including a screen-used movie prop painting from the film Silent Hill. Our guide pointed out two “Crying Boy” paintings (a third was in the gift shop), “believed to be cursed” and according to our guide “known” to mysteriously start fires. For a well-researched article that examines Crying Boy paintings, look up “Curse That Painting!” by Massimo Polidoro (2012) in Skeptical Inquirer magazine and the work of British folklorist David Clarke in the May 2008 issue of Fortean Times. We finally came to the star object of the room: the Bela Lugosi Haunted/Cursed Mirror (they used both terms to describe it). The guide informed us that Lugosi was obsessed with the occult, particularly the practice of scrying. Scrying is the practice of looking into a suitable medium, such as a crystal ball or mirror, in the hope of detecting messages from spirits or visions of the past or future. Our guide went on to claim that Lugosi used this mirror for scrying and that “he did this after his wife died, trying to contact her.” The guide mentioned that this occult practice may have opened a “portal” to the other side. Our guide then related how they have had to call 911 after guests have gazed into the mirror and how she had personally witnessed people physically get sick while encountering the looking glass. We were then offered the chance—if we dared, after having signed waivers in the event we were physically harmed or psychologically scarred in some horrific Lovecraftian way—to gaze into the mirror ourselves. All of us—Donna (my wife), Susan Gerbic, Mark Edward, and myself—didn’t hesitate. Just in case you were worried, my skeptic team did not require emergency services (nor did anyone else). Lugosi married Ilona Szmik in 1917, but they divorced in 1920. In 1921, he married Ilona von Montagh, but they divorced in 1924. In 1929, he married Beatrice Woodruff Weeks, and they divorced just four months later. In 1933, he married nineteen-year-old Lillian Arch and divorced in 1953. He had one child with Lillian, Bela G. Lugosi Jr. Finally, in 1955 he married Hope Lininger, and they remained together until Lugosi’s death (1956). Hope passed away forty-one years later in 1997 at the age of 77. Curiously, none of Lugosi’s wives died while married to him, and therefore he was not a widower and was not trying to contact his recently-deceased spouse. This made me wonder: If this claim was incorrect, what about the claim Lugosi was highly into scrying and the occult? After an extensive search across the vastness of the internet for sources that documented the life of Lugosi, including belalugosi.com (run by his son and granddaughter), I could find no references to him being involved in any sort of occult practices at all. At best, there were vague references to Lugosi “delving vaguely into the occult, more specifically voodoo, in Victor Halperin’s White Zombie” (Scovell 2012) and “leaving behind an occult-obsessed cinema” (Turley 2015); but these comments were in reference to film themes, not his personal life. Saletri was a criminal lawyer and a part-time producer, director, writer, and actor. He wrote several film scripts, most of which were spoofs of classic horror films (McMillan 1986) and succeeded in producing one: Blackenstein in 1973 (which I enjoyed). 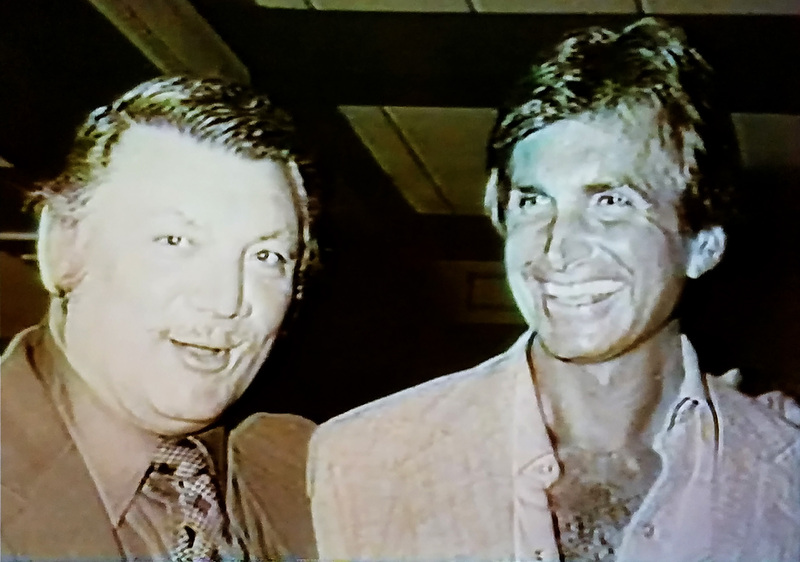 By all accounts, he was a fun and loving man. Sadly, Saletri was brutally murdered in his home on Primrose Ave in Los Angeles. His body was found on July 12, 1982, bound up in the master bedroom with a single gunshot to the back of the head. This was referred to as “gangland execution style” by many reports. Sadly, the murder remains unsolved to this day and most likely will remain that way. What really stood out to me during this tour was that they were calling this object the “Bela Lugosi Haunted (or cursed) Mirror” rather than the “Saletri Haunted Mirror.” Since they made it sound as if the “murderer’s energy and the energy of the death was trapped” within, it only seems logical to at least name it after Saletri. On Bagans’s TV show Deadly Possessions, we meet Cindy Lee, owner of the mirror and niece of Frank Saletri. She brings the mirror to the museum and gives Bagans a little background on the mirror, including the claim that “the mirror was in Bela Lugosi’s house” and her uncle lived there when she was a child (Deadly Possessions 2016). Okay, so this is obviously why the museum named the mirror after the classic horror film star, to capitalize on the name and star-power of the famous actor. Bagans further attaches Lugosi to the mirror by claiming that Lugosi opened up a “portal” during his alleged scrying practices. However, there were several details that struck me as out of place, so I took a closer look. Saletri was murdered in 1982 in the bedroom of his house located at 6216 Primrose Ave. in Los Angeles, a house our tour guide claimed, “after Bela Lugosi died, a fellow by the name of Frank Saletri rented Bela’s home.” This statement gave us the impression that Lugosi had owned the Primrose house and that the murder took place soon after his death. In fact, several realty sites have (sold) listings for this house that begin their descriptions with “This home, rumored to have been Bella Lugosi’s house at one point …” (Estately 2018; Zillow 2018; Trulia 2018). I checked this address against the Residences section of BelaLugosi.com, which has a listing of his former residences from 1921 until his death in 1956, twenty-seven in total (Lugosi Enterprises 2017). The Primrose house was not among them. I began to doubt whether the Lugosi claim had any truth to it whatsoever. I checked another lead. Included on the blu-ray release of Blackenstein (Saletri’s only film that was ever produced), there is a featurette called Monster Kid, which is an interview with June Kirk, Saletri’s sister. In the featurette, I learned that the house Saletri owned prior to the Primrose house was located at 6764 Wedgewood Place in Hollywood—this is the house he actually claimed had belonged to Lugosi, not the house where the murder took place. Strike two, Zak. 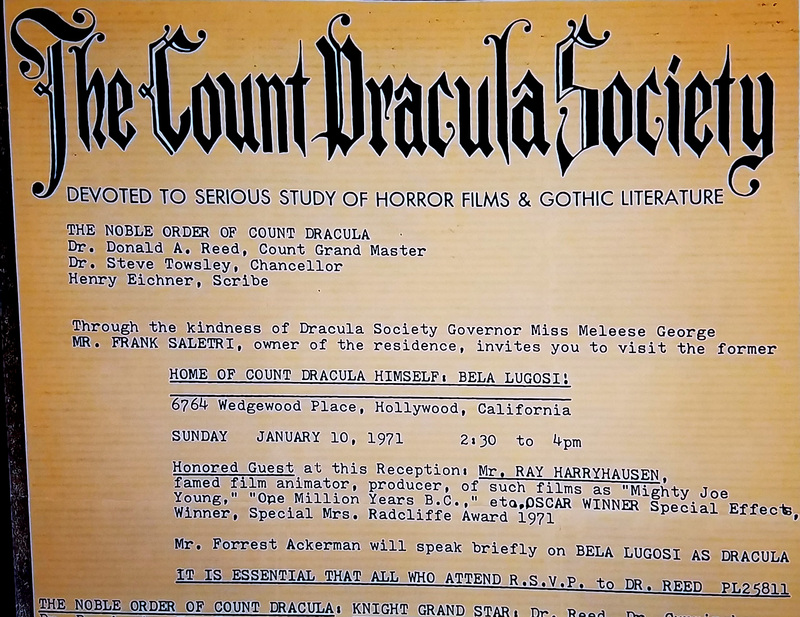 This earlier address also appears on an invitation from The Count Dracula Society for a reception at the “home of Count Dracula himself: Bela Lugosi,” naming Frank Saletri as the owner of the residence (Kirk 2017). Saletri moved into the house around 1966 (Luther 1971), which is still a decade after Lugosi’s passing in 1956. Ten years is a long time, and I highly doubt the high-rent Hollywood Hills house would have remained empty for that duration. I checked the list of residences at BelaLugosi.com again and found the Wedgewood address was also not listed. I searched the internet for any information connecting Lugosi to the Wedgewood home; this address had no recorded link to Lugosi other than the claim of Saletri. According to an article in the Beverly Hills Citizen, the Wedgewood house was razed sometime at the end of 1971 to accommodate the expansion of the Hollywood Freeway (Luther 1971). Thank you for contacting us. We know about the mirror and its inclusion in the museum in Las Vegas. We do not have any information documenting that my grandfather lived at the Primrose residence. My father, Bela Lugosi, Jr., has no recollection of the mirror or of his father mentioning the mirror. Bela Lugosi lived in quite a few places around Los Angeles, and while it is possible that our list is incomplete, we have tried our best, with the help of a trusted researcher and biographer, to record Bela Lugosi’s homes for which we have documentation. The list is currently missing a few addresses and we will be updating our website as soon as possible, but Primrose is not one of them. With this information, I can’t help but conclude the claims promoted by our tour guide (and thus Zak Bagans and his not-so-Haunted Museum), are not supported by any documentation or valid evidence. I re-watched the episode of Deadly Possession, and I realized that Bagans himself seems to be the original source of the “scrying and highly into the occult” claims of this story. During his interview with Cindy, Bagans declares he “knows a little bit about Bela Lugosi,” knew he was into the occult, and suggests that Lugosi used the mirror in his occult practices. Bagans states in the episode “I tend to believe that this mirror was used by Bela Lugosi, that he was doing scrying rituals with it, knowing his past in the occult. And if he did, then this [mirror] would be a portal. And if the portal was left open and it captured the reflection of this murder, then that energy would still be consumed in it, and possibly the killer … the killer’s soul” (Deadly Possessions 2016). This melodramatic statement is pure fabrication and downright non-sensical; seriously, his statement makes no sense whatsoever. Yet this is what they promoted at the museum during my visit. Strike three, Zak. Is there a connection to Bela Lugosi? I don’t think so, but I wasn’t done. So far there has been no documentation (chain of custody or provenance) that the mirror was a possession of Lugosi or that it came from a house previously owned by him. This claim comes from, but does not originate with, Cindy during her interview with Bagans. In the episode she states, “This mirror used to be in Bela Lugosi’s house. My uncle lived there when I was a child.” To be clear: I’m not saying Ms. Lee is fabricating or embellishing a factual connection between the mirror and the legendary Dracula actor; I’m saying this might be a case of mundane misinterpreted or erroneous family history in connection with the mirror. I reached out to Cindy to fill in the gaps of my research. She called me some time later, and we had a wonderful conversation; she is a delight to speak with, being very open and honest with me, as well as understanding where I was coming from as an investigator. Cindy told me that the idea of the house once belonging to Bela Lugosi was just something they had always known, accepted, and never had cause to doubt. She explained that when her uncle moved into the Wedgewood residence there had been various items that had been left behind by the previous owner—the mirror being among them. When Saletri moved out (because the house was being razed), he took all his possessions with him, including the remaining items, to the Primrose residence. Eventually many of these items, the mirror among them, came to be in Cindy’s possession. Cindy agreed to investigate the matter a little further over the next few days but was unable to locate any documentation that would establish a clear connection with Lugosi. However, after speaking about this a little more, she will continue to search her uncle’s belongings to see if any paperwork turns up. If additional information is found, I will certainly update this article to reflect it. Saletri was a big fan of horror movies (Kirk 2017), wrote his own horror-spoof movie scripts, and was a member of many clubs such as The Count Dracula Society. In an interview he gave just before the Wedgewood house was torn down, we learn that “when Saletri moved in five years ago, he also found a scrapbook of clippings about Lugosi” (Luther 1971). It is plausible that the scrapbook was mistakenly assumed to have belonged to Lugosi, and this evolved into the idea the house itself must have belonged to the actor at one time. I’m hoping the scrapbook still exists and can be examined in the future (perhaps it has an owner’s name inside somewhere). In conclusion, there isn’t any available evidence that the house Mr. Saletri owned, or mirror he found in it, ever belonged to Bela Lugosi. The claims made by Bagans about Lugosi being into the occult and practicing scrying with this mirror are entirely false and fabricated—and he should be ashamed of himself for creating and promoting such rumors about someone else’s family (obviously without even checking with them). 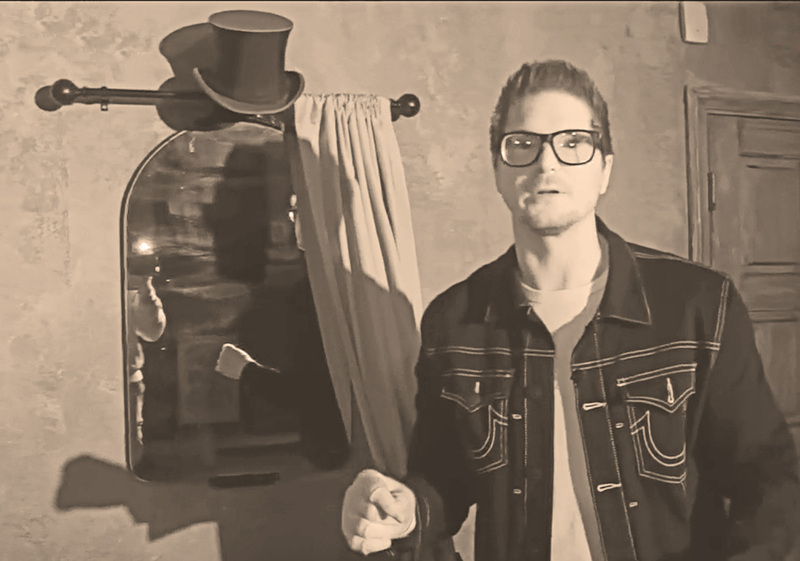 All we can say with confidence, based on the information we have, is that Bagans has a mirror hanging in his museum that was discarded by an unknown Los Angeles homeowner in 1966. I would like to express my gratitude for research assistance to the Lugosi family, Mellanie Ramsey, Cindy Lee, and Donna Biddle. Deadly Possessions (Television show). 2016. “Bela Lugosi’s Mirror and Charles Manson’s TV”. Season 1, Ep. 4. Aired April 23. Estately. 2018. 6216 Primrose Ave. Available at https://www.estately.com/listings/info/6216-primrose-avenue–8#gallery. Kirk, June. 2017. Monster Kid: Interview with Writer/Producer Frank R. Saletri’s Sister, June Kirk. BlackensteiBluRay release. Lee, Cindy. 2018. Personal correspondence via phone calls. Lugosi Enterprises. 2017. Bela Lugosi Residences.Available at http://belalugosi.com/residences/. Luther, Claudia. 1971. “Lugosi House to be Razed.” Beverly Hills Citizen. McMillan, Penelope. 1986. “Sister of Slain Lawyer Offers $10,000 Reward.” Los Angeles Times. Available at http://articles.latimes.com/1986-01-23/local/me-27803_1_slain-lawyer-offers. McPadden, Mike. 2017. Cult Film, Cold Case: Who Murdered the Man Who Made “Blackenstein”? Accessed on December 19, 2018. Available at http://crimefeed.com/2017/06/30826/. Polidoro, Massimo. 2012. “Curse That Painting!” Skeptical Inquirer 36.6 (November/December). Available at https://www.csicop.org/si/show/curse_that_painting. Scovell, Adam. 2012. A Brief History of Occult and Folk Horror. Available at https://celluloidwickerman.com/2012/11/29/a-brief-history-of-occult-and-folk-horror/. Sparks, Lynne Lugosi. 2018. Personal correspondence via email. Trulia.com. 2018. 6216 Primrose Ave. Accessed on December 19, 2018. Available at https://www.trulia.com/p/ca/los-angeles/6216-primrose-ave-los-angeles-ca-90068–2077479860. Turley, K. 2015. The Curse of the Cape: The Real Horror of Bela Lugosi. Available at http://www.theimaginativeconservative.org/2015/11/the-curse-of-the-cape-the-real-horror-of-bela-lugosi.html. Zillow.com. 2018. 6216 Primrose Ave. Accessed on December 19, 2018. Available at https://www.zillow.com/homedetails/6216-Primrose-Ave-Los-Angeles-CA-90068/20807355_zpid/.